The only remaining undefeated team in DeKalb County middle school basketball action is the 9-0 Stephenson Jaguars as regular season play heads into the final two weeks. 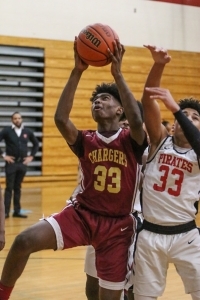 Stephenson leads the boys’ Region 2 standings at 5-0 and have an upcoming meeting with current second place Druid Hills (7-2, 3-2). Champion is currently third at 6-4, 3-3). Tucker leads the Region 1 boys’ race at 7-2 overall and 6-0 in the region and Salem is tops in Region 3 at 10-1 overall and 7-0 in region play. McNair and Cedar Grove split in Region 4 action, but McNair is 8-2 overall and 5-1 to lead the region standings. Cedar Grove is 9-2 overall and 5-2 in the region. Salem leads the way in girls play at 10-1 overall and leading Region 3 with a 6-1 mark. Lithonia is just behind at 9-1 overall and 5-1 in region action. Champion is 9-1 overall and 5-1 in Region 2 to lead the way just ahead of Stephenson (8-1, 4-1). Henderson has a perfect 7-0 mark in Region 1 action and is 9-2 overall with Tucker in second at 7-2 and 5-1. McNair and defending county champ Chapel Hill are neck and neck in Region 4 as both have 5-1 marks to top the standings. McNair is one game ahead with a 6-4 record and Chapel Hill is 5-5. Columbia is lurking at 6-3 overall and 4-1 in league play. The Champion Lady Chargers improved to 9-1 on the season with a 55-22 win over the Druid Hills Lady Dragons last week. Myori Pruitt hit for 22 points and Aaliyah Ismael added 12 in the win. Champion is on top of the Region 2 standings at 5-1. Good defense and a pair of players in double figures pushed the Lithonia Lady Bulldogs to a 34-27 Region 3 win over the Miller Grove Lady Wolverines. Alika Daughertry had a game-high 15 points and Laila Williams added 10 as Lithonia improved to 10-1 overall and 6-1 in Region 3. Miller Grove (7-2, 3-2) was led by Lindsey Myles with 13 points. Malaya Jones scored 35 points to lead the Tucker Lady Tigers to a 39-11 non-region victory over the Stone Mountain Lady Pirates on Saturday. Tucker improved to 7-2 on the season. The Cedar Grove Saints (9-2, 5-2) evened the Region 4 season series with the McNair Mustangs (8-2, 5-1) at one win apiece with a 36-22 win over the weekend. Alvin Houston had a strong 10-points, 10-rebounds double-double in the win while teammate Jaylen Adside contributed 10 points of his own. The Tucker Tigers defeated the Stone Mountain Pirates 64-18 to improve to 7-2 on the season. Keelin Malone led the way with a solid performance of 17 points, 7 assists and 3 steals. The Cedar Grove Saints kept a firm hold on second place with a 60-30 Region 4 win over the Columbia Eagles coming back from the holiday break. Jaylen Adside hit for a game high 14 points and Joshua Daniels added 12 for the Saints. The Stephenson Jaguars remained undefeated at 9-0 with a 62-19 non-region win over Sequoyah. Dylan Levell led a group of three Jaguars in double figures with 11 points while teammates Tahj Evans and Eduardo Hendricks hit for 10 points each in the win. The Tucker Tigers picked up a key Region 1 win as they defeated the Chamblee Bulldogs 49-25 to remain undefeated in region action. Christopher Whitmore scored 15 points and grabbed 7 rebounds in the win. The Champion Lady Chargers rolled to a 55-5 win over the Stone Mountain Lady Pirates in Region 2 play. Myori Pruitt hit for a game-high 23 points to lead three players in double figures. Jayla Thomas hit for 14 points and Aaliyah Ishmael added 10 in the win. The Henderson Lady Cougars remained undefeated in Region 1 play with a 38-9 win over the Peachtree Lady Patriots. Adia Bouldin scored 10 points and Sierra Burns added 8 in the win for the Cougars (9-2, 7-0). The Lithonia Lady Bulldogs had three players score in double figures on the way to a Region 3 50-7 victory over the Freedom Lady Rams. Nakiyah Colbert hit for 18 points to lead the Bulldog trio in double figures while Alika Daughetry hit for 15 and Laila Williams added 12. The Miller Grove Lady Wolverines won their sixth game of the season with a 42-17 win over the Chapel Hill Lady Panthers. Lindsey Myles and Brooklyn Scrubbs both scored 13 points in the win and Jaylen Clark added 10. The Stephenson Lady Jaguars improved to 8-1 on the season with a 44-10 non-region win over Sequoyah. Natalia Gooden had 4 points, 4 blocks and 3 rebounds for Sequoyah (0-8) and teammate Elizabeth Adjovu hit for 4 points and grabbed 3 rebounds. 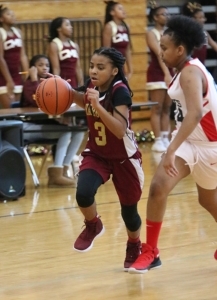 The Tucker Lady Tigers used a 32-19 win over the Chamblee Lady Bulldogs to solidify their No. 2 spot in Region 1. Malaya Jones scored 23 points and Jacinta Hollins added 7.